Made with flat steel bar these English Garden Window Baskets, or as sometimes called hay racks", were inspired by the simple mountain cottages whose window frames were adorned with beautiful, seasonal flowers and foliage from the first breath of spring to the end of fall. The simple strength of the flat steel bar construction is protected with a black powder coating to help protect against the elements. The coconut liner is perfectly molded to fit the trough and is held together with natural tree sap to support growth for several growing seasons. 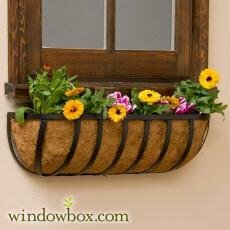 All Hayrack Trough Window Baskets include Coco Coir Liners as shown.